Give your stretchings some bling with our gorgeous Zircon Gold Flesh Tunnels & Top Hats. 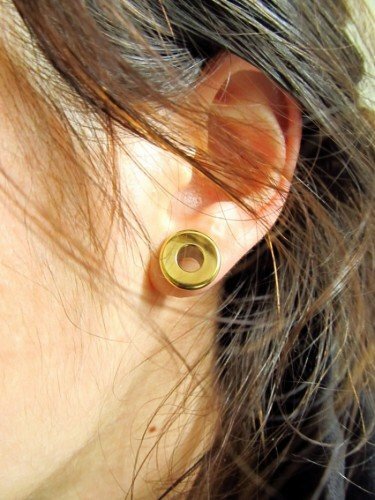 These eye-catching tunnels have a wonderful golden shine that really stands out, perfect for making the most of all your hard work. We also have a full range of Ear Stretching Jewellery to choose from. Zircon Gold PVD coated G23 surgical titanium flesh tunnel featuring one screw-off lip for easy fitting and removal of the flesh tunnel. The threading of the removable lip is on the outer surface of the flesh tunnel stem, so it may be uncomfortable to stretch up using this tunnel. It is best recommended to use tapered insertion pins for this process, making it quicker and safer. And also it's very comfortable because of rounded flare. Dont be put off with the price tag, this is a fantastic product. Its very comfortable to wear and to sleep in. It also makes you feel cool wearing it. It has a awsome shine to it which looks awesome. Great product.